Apart from aloe, this label suggests TTB will allow the term “Rum” to appear larger than “with natural flavors.” And yet, on other distilled spirits specialties, such as an identical product made with a vodka base, it is unlikely TTB would allow “Vodka” to appear in a more prominent way compared to the rest of the statement of composition. 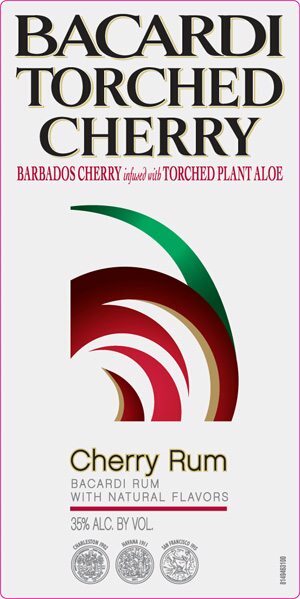 It is not clear why TTB polices the term “vodka” so rigorously, but not other comparable terms, such as “rum.” Another example of this is, the government clearly allows “cherry rum” (as above) but would probably not allow “cherry vodka.” This example is easier to understand because, as a matter of law and history, rum is only made from cane products, so confusion is unlikely. But in the case of a “cherry vodka” it would be more difficult to be sure about whether the product is distilled from cherries or just has a cherry flavor. It is possible that “vodka” is more sensitive due to controversy around this Skyy Blue label from many years ago.